Ever wonder what it’s like to be Speaker of the House? Congressman John Boehner explains. 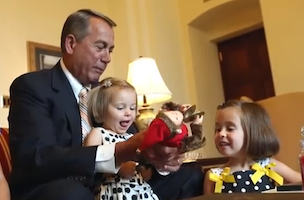 According to the Office of Speaker John A. Boehner 2013 Intern Manual, said monkey “was given to the Speaker as a birthday gift after the joke was made that [Boehner] was just wound up like a doll by his political advisors every night and he would proceed to clap his hands only to have his advisors wind him up again the next day,” as reported by Gawker in August 2013.